The Silver Knapsack Trail is provided by the Sequoia National Forest’s Western Divide Ranger District. One can pick up this two sided white paper at the front desk for free. The information below has been transcribed from a copy obtained in the fall of 2011. Please check with the district office for the most current version and trail information. If you want to carry small versions of the map, there are seven 8.5″ x 11″ pieces you can download and print or store on your electronic device. If have access to a 22″ x 34″ plotter, then one large map may suit your needs. The hike is located in the spectacular Golden Trout Wilderness in Sequoia National Forest and the southermost area of Sequoia National Park. The trail makes nearly a complete circle, beginning at the Summit trailhead and ending at Clicks Creek trailhead. The trail is approximately 40 miles in length, and offers a six day hike, one of which is a lay-over day. The map pertaining to this trail is the Golden Trout Wilderness Map. Areas of interest along the trail include seven lakes, with fishing and swimming at most of them, as well as the Little Kern River. Check with the Department of Fish and Game on regulations concerning special fishing restrictions in the Golden Trout Wilderness. The trail for the most part is above 7,000 feet, and provides magnificent views of the surrounding forests. Wilderness and campfire permits are required. Both may be obtained by calling or stopping in the Western Divide Ranger District Office. 559-539-2607 at 32588 Highway 190, Springville, CA, 93265. Pets are not allowed in the National Park; therefore, they should not be included on this trip. Mechanized machinery are not permitted inside the Wilderness. This includes mountain bikes, motorcycles, chainsaws, etc. Summit Trailhead to Mountaineer Creek (1.7 miles). Mountaineer Creek to Jacobson Meadow (2.3 miles). Jacobson Meadow to Mowery Meadow (2.0 miles). Mowery Meadow to Alpine Meadow (0.5 miles). The day begins with a 30 minute, 10 mile drive from Highway 190 to the Summit Trailhead on a dirt road. A large parking area is provided at the SUmmit Trailhead. Road junctions are well marked. The first day will be moderate, and is splendidly shaded. It will probably involve about 3-4 hours in hiking time. Camping is possible at all of the meadows and creeks listed above. Each site will hold 1 group without a problem. However, the best camping is at Alpine Meadow. There is adequate room for 4 or 5 groups, and most likely water and wood. Just before switching back down into Jacobson Meadow, the trail runs along a narrow ridge. From the Pinnacle you can view the San Joaquin Valley to the west and the Western Divide to the east. Over the years, this spot has become known as “inspiration Point.” The name fits. The trail from Alpine Madow to the cut-off to Maggie Lakes is a fairly good climb. From there the hiker descends down a steep and rocky trail to the bottom of a small canyon, enterigng a large campsite. This is not a stop, but a group may stop there if it wishes. The trail is steep from that point to Lower and Upper Maggie Lakes. Maggie Lakes offers fishing and swimming. There is a trail up to Maggie Mountain from the upper lake. This is a good lay-over day. Maggie Lakes to Frog Lake (1.0 mile). Frog Lake to Twin Lakes (1.2 miles). Twin Lakes to National Park entrance (1.0 mile). National Park entrance to Summit Lake (1.1 miles and optional detour). National Park entrance to Windy Gap (3.1 miles). Windy Gap to Quinn Snow Survey Cabin (2.2 miles). Quinn Snow Survey Cabin to Soda Spring Creek (1.0 mile). The trail to Frog Lake leaves by the upper end of Lower Maggie Lake. The hiking from Twin Lakes is moderate. It then climbs steeply at Sheep Mountain. At the top is the entrance to Sequoia National Park. The trail down to Summit Lake is short but steep, and the climb out can be difficult. You may forgo this optional side trip. The trail to Windy Gap is very smooth, but may be snow covered during the early part of the season. From there, the hiker drops swiftly down to Quinn Snow Survey Cabin and continues on down thte canyon for about a mile. The hiker then crosses Soda Spring Creek and enters a large camp site that sits right above a natural soda springs. This site will hold about 3 groups. 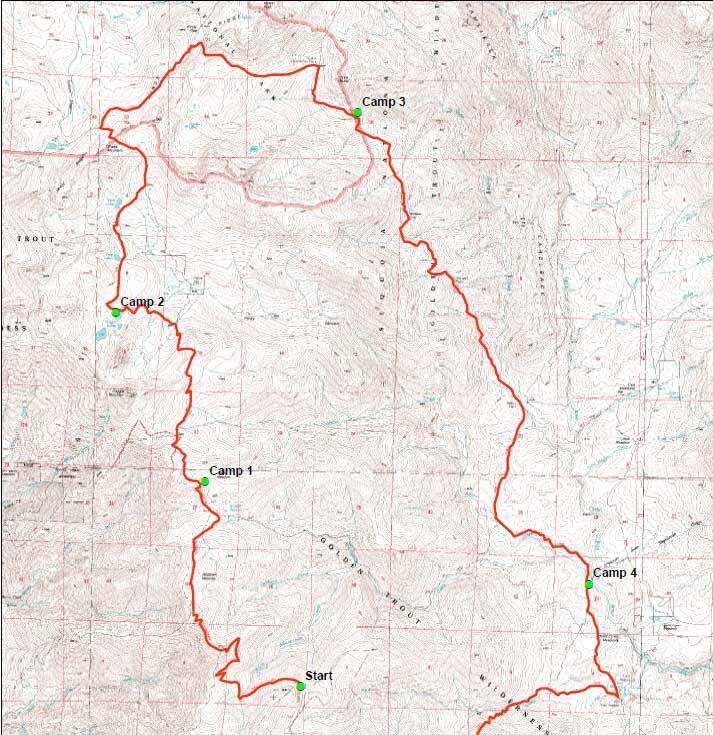 Soda Spring Creek to Walker Campsite (2.8 miles). Walker Campsite to Little Kern River (4.7 miles). From Soda Spring the hiker ascends by switchbacks out of the canyon. The trail from the top of the ridge to the Little Kern River goes downhill and is very steep in some places. Walker campsite is where the old Walker Cabin used to be. The Campsite on the Little Kern is just across the river from where the trail and Mountaineer Creek meet. This site is very large and has enough room for six or seven groups. Firewood may be difficult to find. Swimming and fishing are available here. Little Kern River to Grey Meadow (2.1 miles). Grey Meadow to Clicks Creek Meadow (1.6 miles). Clicks Creek Meadow to Clicks Creek Trailhead (4.4 miles). The trail from the Little Kern to Grey MEadow is steep and from Grey Meadow the trail climbs even more steeply up Clicks Creek Canyon. Grey Meadow is a large meadow with a Forest Service Ranger Station which may or may not be occupied. There is enough room for five or six groups to camp. Along the trail there is a small secluded site next to Clicks Creek that offers and abundance of wood and water. The hike back up to Clisk Creek Trailhead will be one of the roughest parts of the whole trip. The trail climbs one last ridge and descends gently down to Clicks Creek Trailhead, ending the hike. Clicks Creek Trailhead and Summit Trailhead (the beginning of the hike) are separated by about four miles. You may want to have a car waiting at the Clicks Trailhead if you don’t wish to hike the additional four miles to Summit Trailhead. Is Florence Peak on this trail? I am going on this trail in July. No. Florence Peak is not on this route. It is NE of the Day 3 destination. How dontoubgetvfrom the “end” back to the “start”? Is it on a paved road?